Four ingredients to make these homemade croutons! Top your soup, salad, or chili with these crunchy, flavorful morsels and you’ll be a happy person. 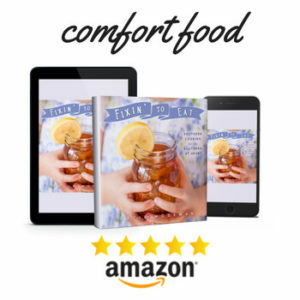 My love of croutons on soup and chili started many years ago with a certain take-out chili, for which I would always make a special request at the window for a packet of salad croutons. 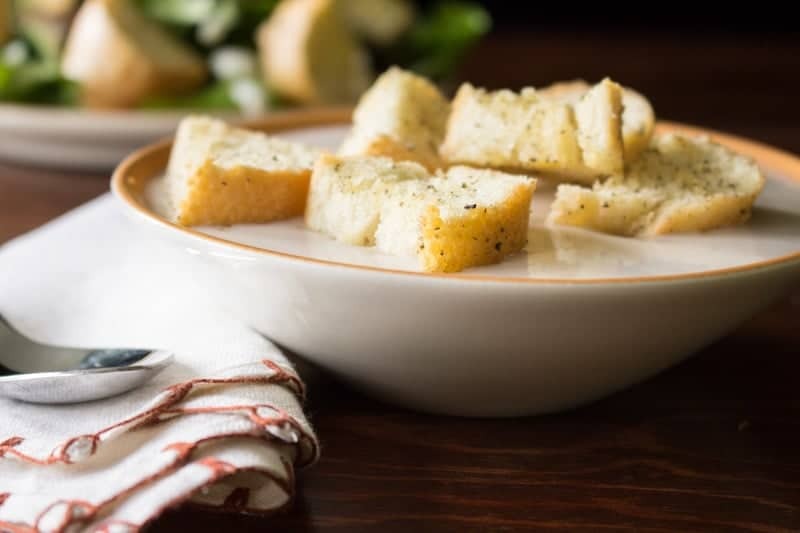 Now that I cook at home far more often than I get take-out, I use my own homemade croutons recipe for a crunchy topping on soups, chilis, and stews. 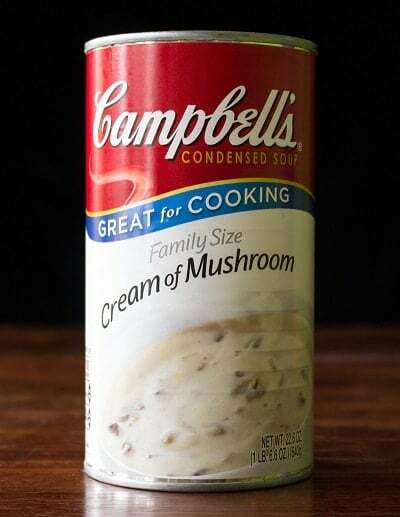 For today’s soup, I’m taking advantage of one of the most classic and convenient soups you can find: Campbell’s Cream of Mushroom Condensed Soup. Rather than serve it with plain old crackers, I’m putting a twist on it by topping it with freshly made croutons. 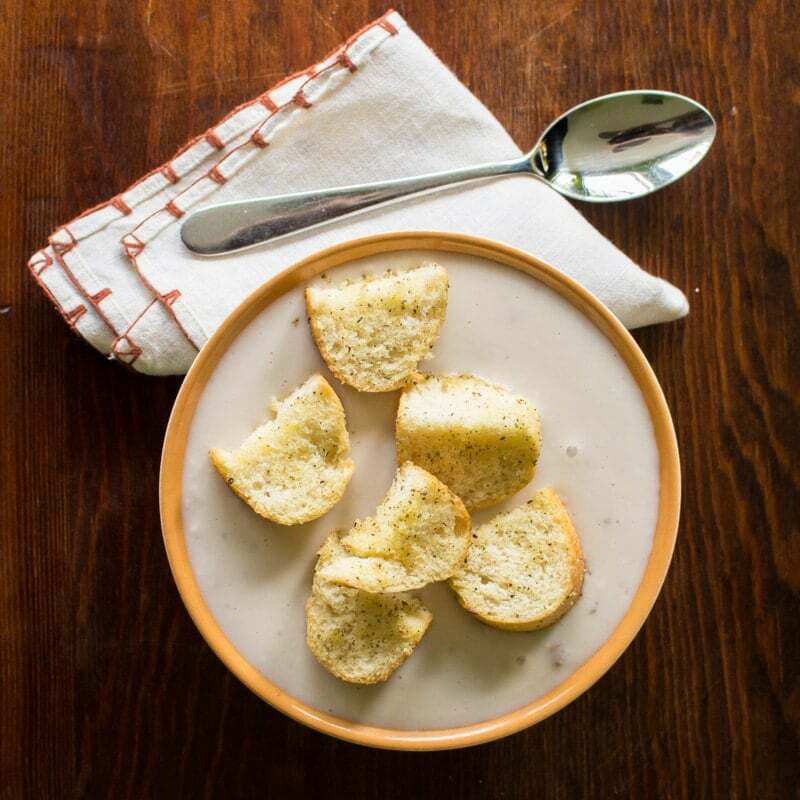 At busy times of year (like the holidays), a soup like this one can be a real time-saver. 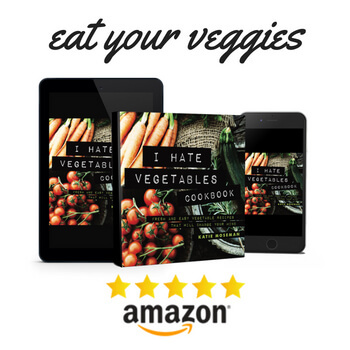 Serve it as a side dish topped with croutons, or pair it with a salad and toss some homemade croutons on both! 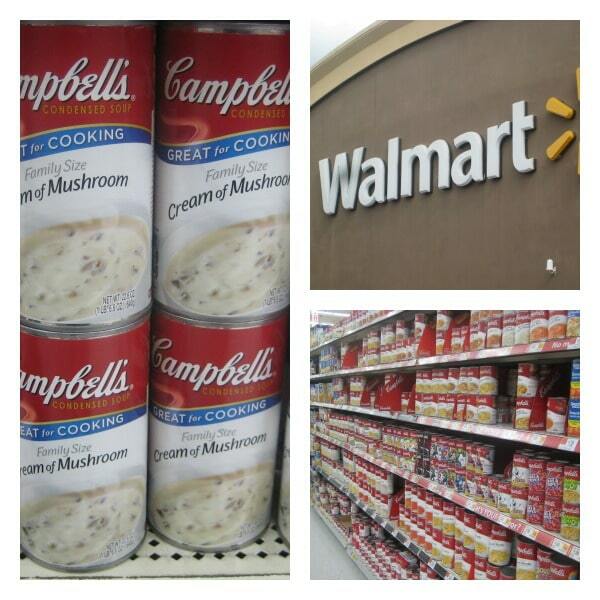 I picked up my 23 ounce can Campbell’s Cream of Mushroom Condensed Soup (the larger size) at my local Walmart on the soup aisle. While I was there, I picked up a French baguette to make into crunchy homemade croutons. 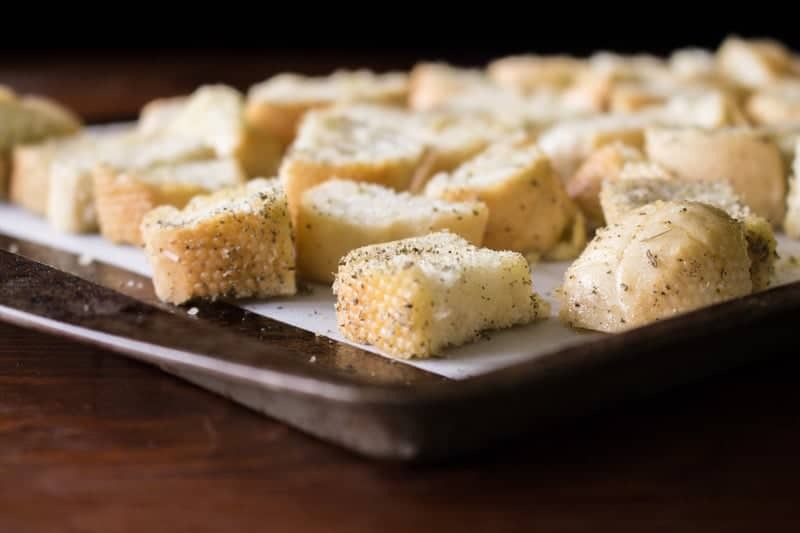 Once the bread has been cut into pieces, simply toss with a little olive oil, sage, salt, and pepper, spread on a lined baking sheet, then bake to crunchy perfection. Four ingredients to make these homemade croutons! 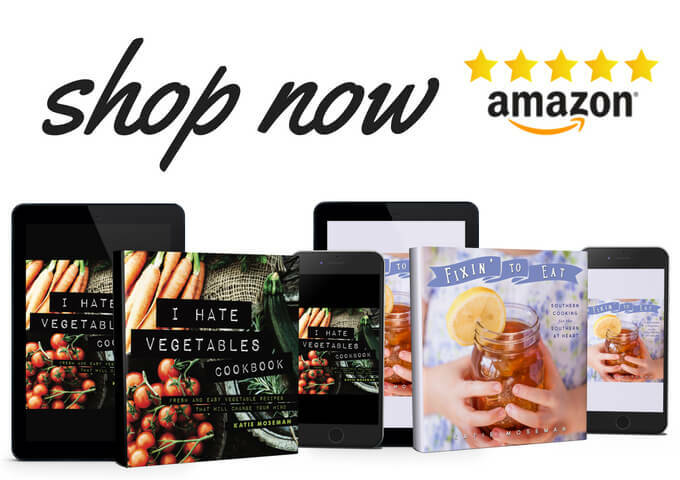 Top your soup, salad, or chili with these crunchy, flavorful morsels and you'll be a happy person. Preheat the oven to 350 degrees and line a baking sheet with parchment paper or foil for easy cleanup. Cut the baguette down the middle into two long pieces. 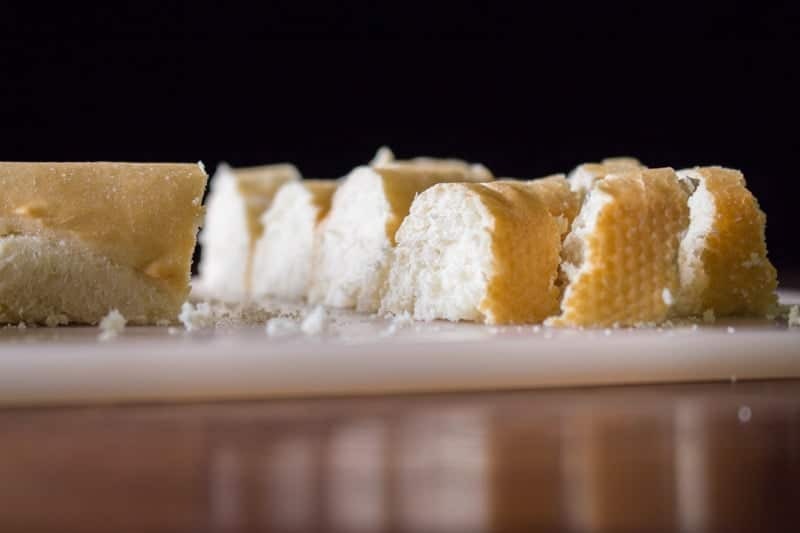 Cut across each long piece until you have many half-moon shaped pieces of bread. In a large mixing bowl, drizzle the olive oil over the bread pieces and toss until thoroughly coated. Sprinkle on the salt, black pepper, and sage, then toss again until evenly coated. Spread out the croutons on the baking sheet. Bake for 20 minutes, then let cool to room temperature on baking sheet. Croutons become crispier as they cool. Get more ideas from Campbell’s for your holiday planning! Homemade croutons are awesome! I love your addition of sage. I am a sage fanatic! Homemade Croutons are THE best. 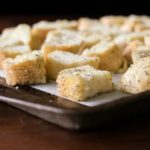 Homemade croutons are so easy to make and they just taste so much better than store-bought! I know, right? I can’t believe I never tried this before! I’m fairly certain I would just eat those croutons, soup, schmoup. 😉 They look so delicious. I’ll admit- we ate them right off the baking pan every time we walked by!